Before and after the 2009 building collapse. The conversion of the 150-year-old Tribeca building at 71 Reade Street into an upscale boutique hotel hit a bit of a rough spot when a chunk of the building collapsed in 2009, but you can't keep a good business venture down! The Tribeca Trib reports that a group of developers, including Aharon Vaknin, owner of the collapsed building, are ready to proceed with a new hotel plan. The Landmarks Preservation Commission will soon weigh in on the Goldstein, Hill & West design, but it looks similar to the old design, even if the original cast-iron facade was torn down following the accident. The new design calls for a limestone facade with thin steel arches on top of square window panels, and eight stories in all. Four columns recovered from the old building will be incorporated into the Reade Street storefronts. The hotel extends through the block and would use the 87 Chambers Street address. A nice fit for the Tribeca South Historic District? Hey, it beats a pile of rubble. It's hard to believe, but there was a time when the landmark rowhouses at 25-41 Harrison Street in Tribeca were looked down upon. Built during the first half of the 19th century, the houses fell on hard times but were spared from demolition during the early days of the Landmarks Preservation Commission (three of the houses were moved from Washington Street), and their exteriors were rebuilt in 1975. At the time, architecture critic Paul Goldberger wrote that "there are facades at Disneyland that look more real," and according to an old Christopher Gray piece, the city put the houses on the market for, brace, $35,000 to $75,000. Um, their values have slightly increased. One of those old townhouses, 27 Harrison Street, has just hit the market. When it last traded hands in 1998, it sold for $1.275 million. The asking price today? A cool $5,625,000. This was the house once occupied by John McComb Jr., who designed City Hall with Joseph Mangin. The four-story house has four bedrooms, four brick fireplaces, a 400-square-foot private garden and a copper soaking tub that looks like it's just hanging out in the master suite. Sadly the listing doesn't have any pictures yet, but here's the floorplan. Do buyers care enough about history to meet the asking price? Moved posts from the North Tribeca thread that are about development south of Hubert St.
Looks like the building at the NW corner of Broadway, 43 Worth St., will be converted. I wish more of Broadway was landmarked. This stretch has already suffered abominations. The Ed Hardy T-shirt of Tribeca townhouses is what we called the proposed renovation of 187 Franklin Street, a three-story, single-family home that the owners want to expand by two floors. Architect Jeremy Edmiston also designed a new look for the building, one with angled windows, new balconies and a wavy red-brick facade that looks like flames on the side of a hot rod. Neighbors felt abused, confused, and less than enthused. But the proposal made its way to the Landmarks Preservation Commission, where it was struck down by an irate board. Oops, sorry, force of habit. Actually, they love the thing! Now that we have a more complete look at Edmiston's revised plans (above) and can see the details of the brick facade, the future 187 Franklin looks a lot less gorilla juicehead, as Snooki might say. The building went up in 1993, but it's part of the Tribeca West Historic District, making LPC approval a must. The commission voted 9-0 in favor of the proposal, using words like "phenomenal," "symphonic," "exciting," "smart," and "delirious." Not everyone was overjoyed. The rep for preservation group the Historic Districts Council, while urging the LPC to reject the plan, said, "The proposal takes an infill building that quietly respects its neighbors and turns it into a building screaming out for attention." But that's a good thing! At least according to Bill Higgins of Higgins Quasebarth, a preservation architecture firm, who showed the commissioners other buildings in the district that have fancy fire escapes and sculptural brickwork. Commissioner Christopher Moore said that when he saw the project he asked himself, "Is this a contribution or is this lunacy?" His answer: "It's a valuable contribution and possibly a phenomenal contribution." Edmiston said the facade will be comprised of 14,538 bricks. Get ready to feel the burn real soon. A penthouse blocks from the Holland Tunnel has 4,500 square feet of outdoor space. New York City can seem like a mighty unpleasant place if you’re trying to get into or out of the Holland Tunnel. The horns, the gridlock and the crush of cars competing for fewer and fewer lanes — it is easy to wonder who would live amid such madness in the northern reaches of TriBeCa. What misery it must be for those poor apartment dwellers. High above Hudson Street, the most expensive apartment ever sold south of Columbus Circle when it went for $30.5 million in 2009 is going back on the market, looking to break records again with an asking price of $45 million. The duplex penthouse atop the 14-story Art Deco former industrial building at 145 Hudson Street feels as if it were not in the same universe as the clogged streets below. It is a glass box in the sky, with panoramic views. Designed by the architect James Carpenter, who is known for his work with glass structures, it has nearly 7,500 square feet of interior space and 4,500 square feet of outdoor space on a wraparound terrace. There are two stairways and three fireplaces, and customized millwork in plain-sawn cherry wood throughout. As one might expect at such a high price point, there are unusual features like a climate-control system, self-adjusting lighting, and walls that allow artwork to be hung without fear of damage from sunlight. The current owner allowed a tour on the condition that he not be identified and that no photos be taken of his extensive art collection, which made full use of the specially designed walls. “Everything is customized to the nth degree,” said Leonard Steinberg, a managing director of Prudential Douglas Elliman, the broker handling the sale. The apartment has an open and modern aesthetic, with polished concrete complementing all the glass. On the main floor, insulated glass panel dividers can either be closed to create more intimate spaces, or opened, to create a larger one. Mr. Steinberg said that while the penthouse had a modern feel, the terrace reflected the building’s Art Deco origins, with restored parapets that provide both architectural detail and a sense of privacy not found in any other penthouse in the area. In fact, this was the second go at creating a penthouse at this property. The original design and construction ran into trouble after the Landmarks Preservation Commission found that it was not appropriate for the neighborhood. For years, enraged residents were unable to move into their apartments because the commission’s decision kept the building — known as Skylofts — from getting its certificate of occupancy. In 2005, the developers were forced to tear down the original penthouse. 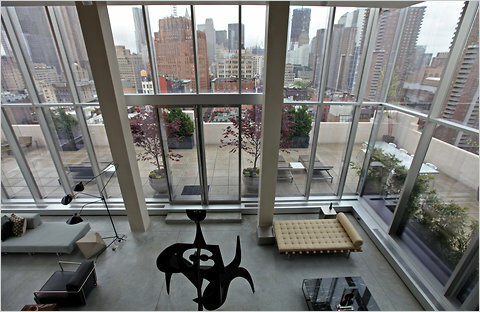 Mr. Steinberg said that after this episode, they decided to up the ante, creating the current duplex penthouse in its place. Looking out at the traffic circle around Hudson Square, rendered mute by the thick glass walls, Mr. Steinberg said that although the tunnel might evoke thoughts of aggravation, the traffic was in reality worse in other areas. “It is probably 20 percent of the traffic at Fifth Avenue and 75th Street,” he said. When the fashion photographer Antoine Verglas bought his apartment at 169 Hudson in 2001, he viewed the tunnel with some trepidation. But, after years of living and working out of his 4,400-square-foot loft, which sold late last month for $5.2 million, it was hardly noticeable, he said. In fact, although the real estate values in TriBeCa began their rapid ascent in the 1990s, the northern stretches of the neighborhood, especially the streets surrounding the tunnel, took a bit longer to catch on with wealthy buyers. Mr. Verglas bought the Hudson Street apartment, which then was just raw space, for $1.3 million. He recalled that when he first moved in, the area retained some of the grittiness that one might expect in an area that until a decade or two ago was more known for exhaust fumes than luxury properties. But soon after he arrived, he said, other celebrities were also drawn to the property, including the rapper Sean Combs. Mr. Verglas designed his apartment as a three-bedroom space, but also maximized its potential as a photo studio, including a translucent bathtub that he said felt something like a swimming pool — a useful amenity when your clients include Sports Illustrated swimsuit models. He was not thinking about selling until his broker, Richard Orenstein of Halstead Property, suggested that he could find a buyer, especially because there were so few luxury apartments on the market at the moment. Mr. Verglas decided to take his advice. But he will miss the neighborhood around the tunnel. This is great news! I always hated that empty corner, and the proposed design is really nice. Hopefully, the empty lot on North Moore and Hudson will be developed soon. That's going up fast. Nothing was above street level two weeks ago. The big parking lot is finally getting developed. Design was changed by Adjmi & Andreoli. NY developers need to hire Adjmi more. They are good.